Flavius Valerius Constantinus, a.k.a. 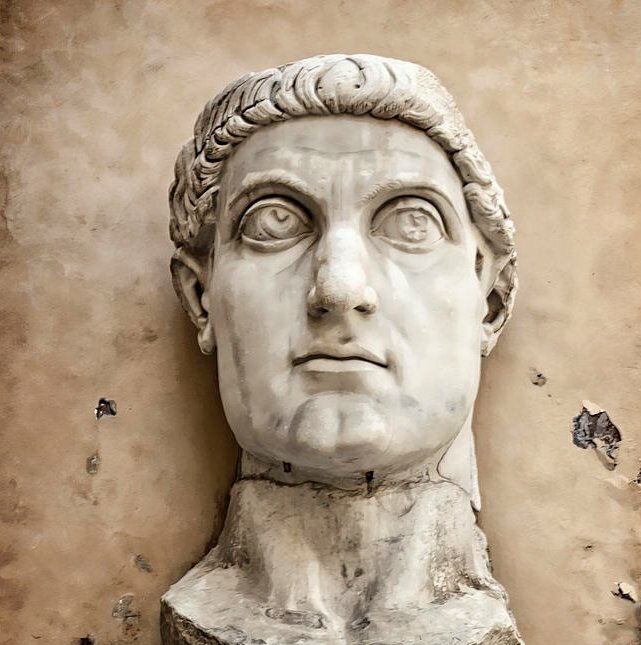 Constantine, was born at Nis on Feb. 27, 280, in what is now Serbia, son of the commander Constantius Chlorus (later Constantius I) and Helena, a Balkan barmaid, Constantine became co-emperor with his father in 305. Following the example of his father and earlier 3rd-century emperors, Constantine was a solar henotheist, believing that the Roman sun god, Sol, was the visible manifestation of an invisible “Highest God” (summus deus), who was the principle behind the universe and companion of the Roman emperors. Constantine’s adherence to this faith is evident from his claim of having had a vision of the sun god in 310 while in a grove of Apollo in Gaul, France. At that time Christianity was exploding throughout the Roman Empire causing earlier Emperors to regard Christians as a threat to the empire because they refused to acknowledge the divinity of the Caesars. In 312 Constantine prepared for battle against Maxentius, his rival in Italy. On the eve of the impending battle, and greatly outnumbered by his opponent’s army, Constantine reportedly received a dream. He claimed to have seen Christ who told him to inscribe the first two letters of his name Christos in Greek (XP, chi rho) on his troops’ shields and banners. Thereafter this became the symbol of Roman Christianity. The next day he reported seeing another vision in the sky of a cross superimposed on the sun and emblazoned with the words in hoc signo cruces vinces, “in the sign of the cross you will be the victor.” Constantine immediately adopted the cross as his emblem and had it put on troops and banners. The following day Constantine defeated Maxentius in the battle of Milvian Bridge. 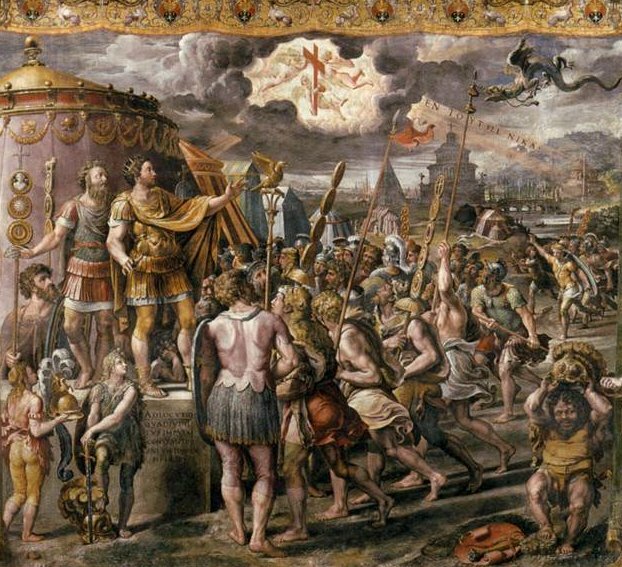 A fresco in the Vatican, (The Sala di Constantino, Palazzi Vaticani, Rome) painted by Raffaello (c. 1509 A.D.) depicts the moment that Emperor Constantine saw the cross in the sky. 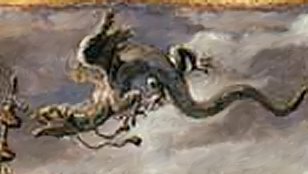 In the fresco a banner displays a winged serpent or dragon, the symbol of ancient Pagan Rome. When Constantine defeated Maxentius at the Battle of Milvian Bridge, near Rome, the Senate hailed the victor as savior of the Roman people. Thus, Constantine, who had been a pagan solar worshiper, now looked upon the Christian deity as his new good luck charm. Persecution of the Christians was ended, and Constantine’s co-emperor, Licinius, joined him in issuing the Edict of Milan (313), which mandated toleration of Christians in the Roman Empire. As guardian of Constantine’s favored religion, the church was then given legal rights and large financial donations.